What if I told you that thinking about your future makes you more present? I know its sounds like an oxymoron. You’re probably thinking that I am messing with you or that I am crazy. Everyone talks about being more present and NOT thinking about the future. And yes I get that. Yet I think there is one thing we are missing with that philosophy. Thinking about the future is ok. It is WORRYING about the future that isn’t. It’s planning to the nth degree and letting those plans to be weights around our shoulders. It is being inflexible about what is to come, and like I said, it is worrying and what iff-ing all over it. I believe thinking about our future makes us more present. Why? Well… our minds make things real to us before they become apparent to anyone else. It all starts with an idea, a spark, a vision. So in a sense our future is with us right now. This present moment is the beginning and continuation of your future. In the now we are creating the future. The notion of possibility means that you have to be present. It’s about stepping into the moment and choosing to see that possibility now. Close your eyes and you can see it, you can be there. In this place the possibilities are real, endless and alive… and not only does it feel really good but it is rewiring the mind. I believe it is about existing in that place of possibility as much as possible… and that doesn’t mean quitting your job/business/family/home and going to live in a commune, or packing up and having to live permanently in a yoga retreat or even wake-up at 5am every damn day! All of this future gazing, visualising and dreaming doesn’t come at the detriment to your present. In fact it only serves to enhance your present. It makes you more conscious of the decisions you are making now because you can see who you are in the future, from the decisions you make and the desires you have today. Its not about stressing about the future, its about changing the way you perceive it, its recognising that you are a co-creator and have a hand in what it looks like and then using it as a crutch for joy, excitement, happiness, peace and love. You can simply choose the possibility. And here are some ways that you can do just that. Visualising yourself in that place. Developing a loving inner voice instead of the inner critic. Listening to podcasts… for reals! Find the ones that expand, excite and light you up. Reading books that help you grow. Journaling… write it out. Always. Spending time with people who uplift you. Take action… take a small step, do something! This is the soul work made easy. Nicola is a Certified NLP Coach living in London, with a sassy 4 year old for a boss. She helps creative women to cut the crap and remove the blocks so that they can get on with putting their work out into the world and changing their lives, and other people’s lives in the process. She is on a mission to rewrite the stories that we have adopted or been assigned. The ones that hold us back. With A Life More Inspired she helps you change them through beautiful products, tools and techniques – as well as through her Dream Do Club and private coaching sessions. 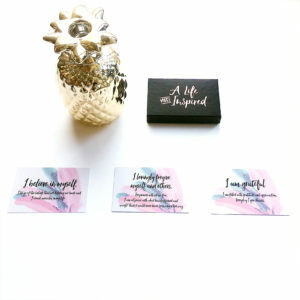 DISCOVER THE LIFE MORE INSPIRED AFFIRMATION CARDS HERE.